Looks like the new 2006 Honda Civic is set to be on Malaysian roads pretty soon. 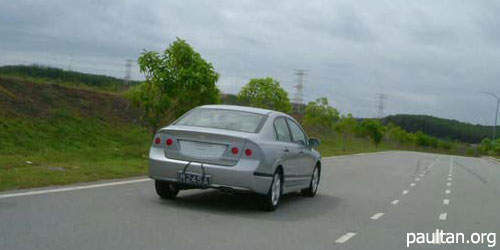 These spy shots were sent in by a reader, and apparently they were shot being test driven in Shah Alam. Minimal camouflage with only some black strips on the sides of the cars and the rear light cluster covered up. There are also no badges on the car, but the shape is just too recognisable! From the looks of it so far, we’re definitely getting the JDM model as opposed to the USDM model. 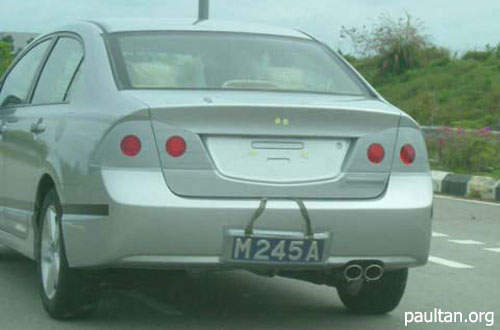 Twin tailpipe, nice! The potential for this new car’s aesthetics are amazing, as shown by Mugen with their Dominator Concept. No news on the launch date yet, but if you have anything interesting like spyshots to contribute, shoot me an email using the contact form.